We believe that it is just as important for a nanny to interview a family as much as it is for a family to ask a nanny questions to ensure the best fit. These are some questions you might want to go over during an interview with a family while deciding if they are the right fit for you! 2) Are you from here? Do you have family nearby? 3) What brought you here (if not locals)? 4) What do you both do for work? 5) Do you work from home? What percentage of the time? 6) What is your work schedule? How often does that change? 7) Are you willing to guarantee a nanny's hours every week? 8) How far in advance do you know about schedule changes? 9) Do you have pets? Where do they spend the day? 10) Can you describe your parenting philosophy or style? 11) How would you describe your child’s temperament and personality? 12) How do you discipline? 13) Any issues that you would like to address regarding sleep, behavior, etc? 14) Have you ever left your child with a caregiver (gym daycare, church nursery, a family member)? 15) What virtues/characteristics are most important in a nanny? 16) What are the job expectations and responsibilities? 17) Are you ok with us going on outings? 18) How long was your last nanny here? 19) Why did you hire her? What drew you to her? 20) If you could have changed one thing about her, what would it be? 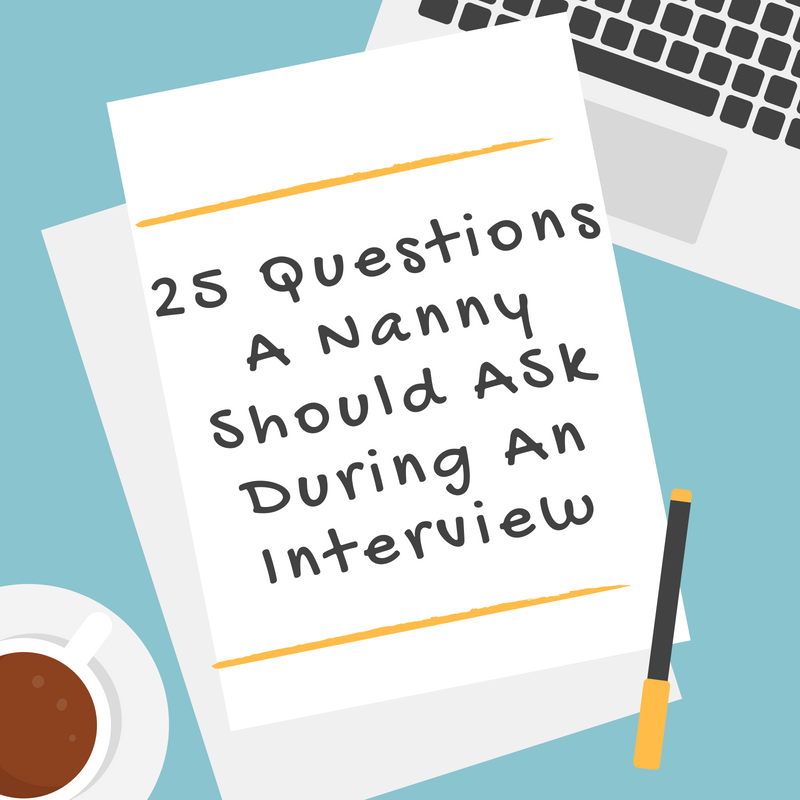 21) How long do you plan to employ a nanny? 22) Do you have a backup plan if your nanny gets sick? Who will take care of the child? 23) What job benefits are you offering? 24) Do you have a nanny car or would your nanny be expected to drive their own car? Do you plan to reimburse for gas mileage? 25) Do you expect any changes to the position in the first year (move, new baby, different hours, etc. )?